They might not get you from one floor of a building to another; in fact, you might not even be able to step on them without sliding off or getting vertigo. 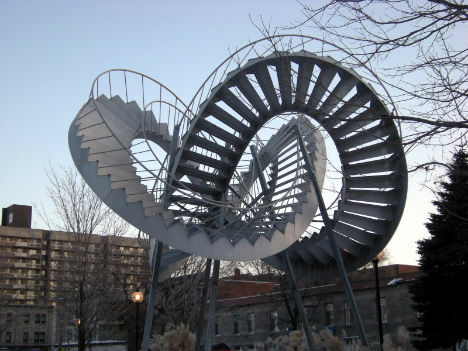 But these 15 spectacular floating spiral staircases and stairways to nowhere go beyond utilitarian architectural features that resemble modern art – they are art. From a transparent red staircase made of sheer fabric to massive sculptures twisted into knots, these stairs serve as symbol and metaphor, not to mention eye candy. 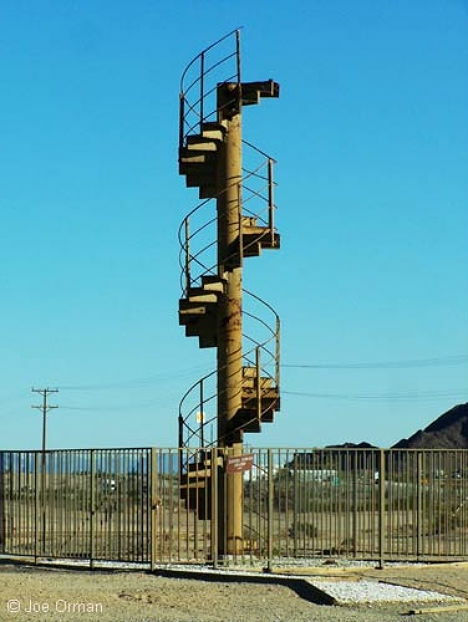 Would you have the strength of stomach to take on this totally terrifying stairway? 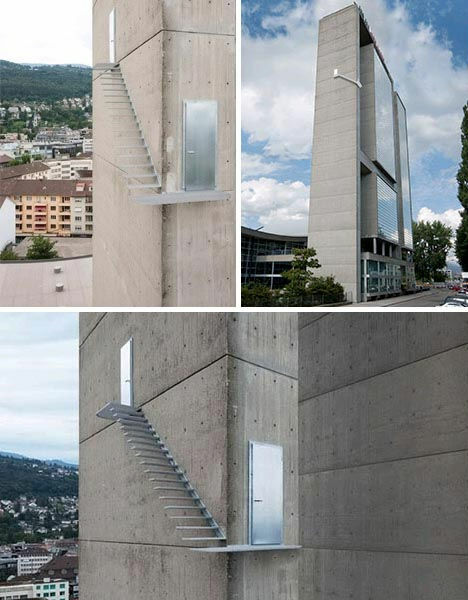 Dozens of feet above the ground and lacking any kind of handrail, these steps connecting two steel doors on a high-rise look like a building inspector’s nightmare. But they’re not for actual use – they’re a concept design by artists and architects Sabina Lang and Daniel Baumann. 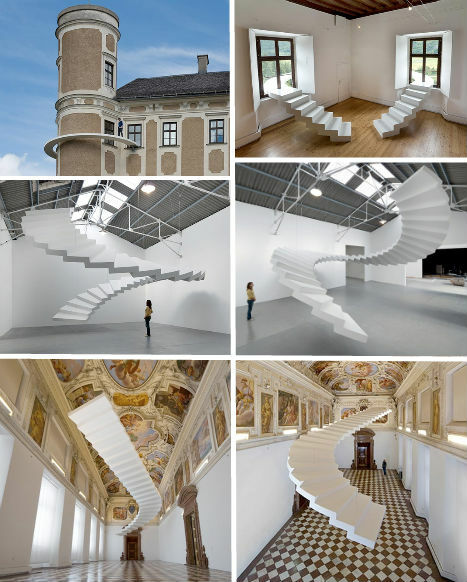 Lang and Baumann didn’t stop there with their incredibly artistic staircase designs. 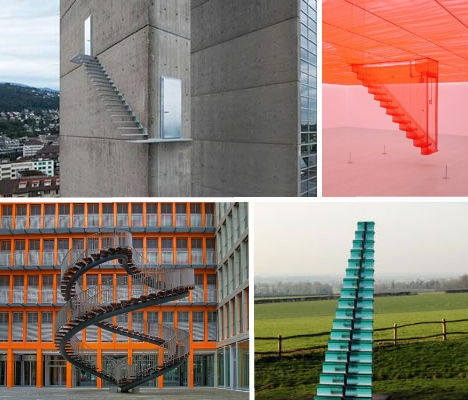 Their series ‘Beautiful Steps’ features not only twisting white spiral staircases that hover in mid-air in gallery spaces, but also a curved stairway that leads out one window of a building and back into the same room through another window. Stairs aren’t just a functional way to get from one place to another as far as contemporary artist Rachel Whiteread is concerned. 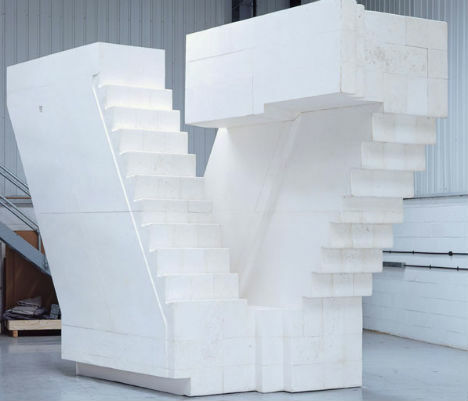 She takes casts of industrial staircases and turns them into hulking white abstracted sculpture, giving the negative space a physical presence. Walking up this set of stairs may not actually get you anywhere, but it sure would be good exercise. 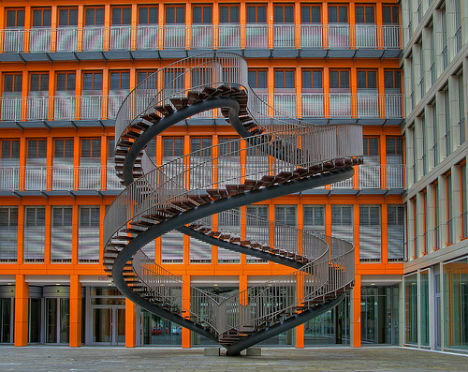 Olafur Eliasson’s sculpture, entitled Rewriting, is a route to nothingness in the middle of a Munich office building’s interior courtyard. 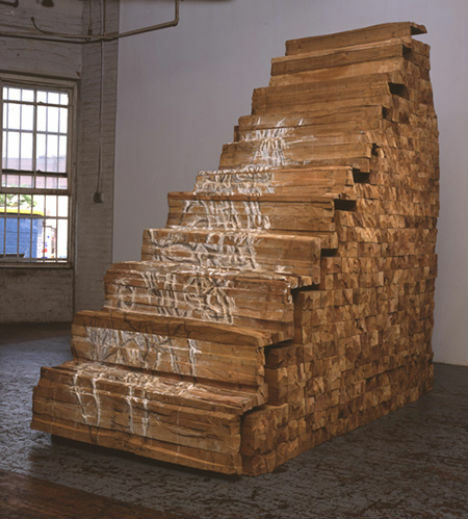 As far as staircase art goes, ‘Floating Staircase’ by Ursula Von Rydingsvard is actually quite functional, albeit extremely heavy and bulky. But once again, function is simply not the point. The artist, who grew up in post-World War II refugee camps in Germany in which nearly every surface was made of wood, finds a sense of humanity in the most mundane objects. “The way in which I manipulate the cedar is very important to me, but I have a feeling that I even learned from things that I never saw. Working with it and looking at it feels familiar,” she told PBS. Jacques-Andre Istel believes that he has identified the exact center of the world, and that it is on his own land in Felicity, California. 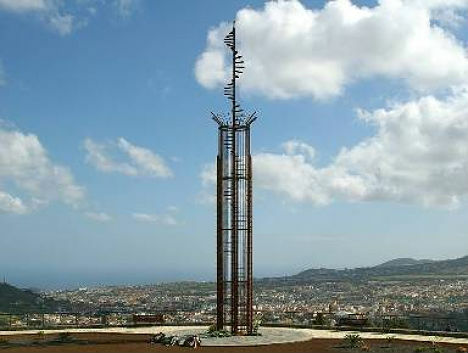 This town, named after Istel’s wife, is packed with all kinds of bizarre and fascinating monuments, including a spiral staircase that was salvaged from the Eiffel Tower in 1989. 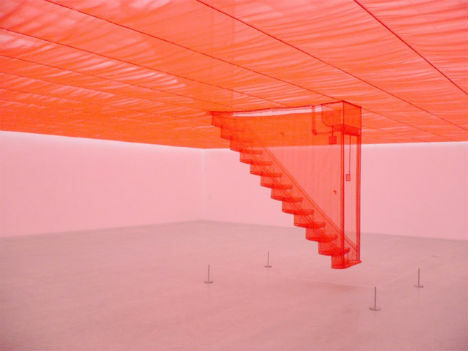 If it weren’t for the vibrant red color, Do-Ho Suh’s staircase would seem as if it were barely there, diaphanous and airy, suspended from stainless steel tubes. It’s part of a series called Reflections, sheer nylon reproductions of spaces that are meaningful to the artist but seem surreal, losing tangibility, almost like a fading memory. 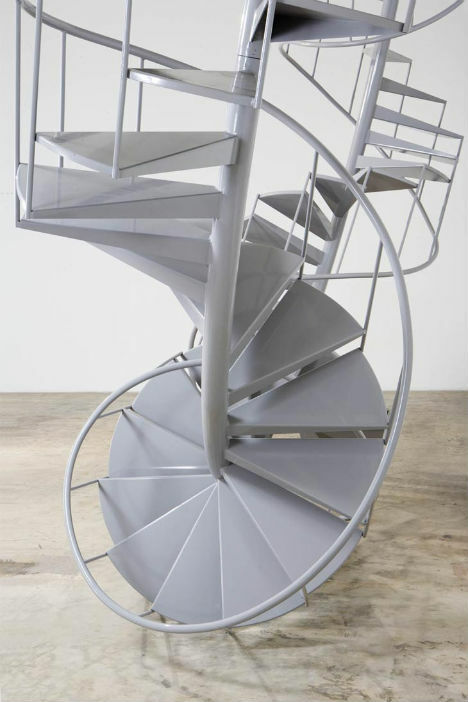 Leaning back without any apparent support, Danny Lane’s staircase seems to defy physics. 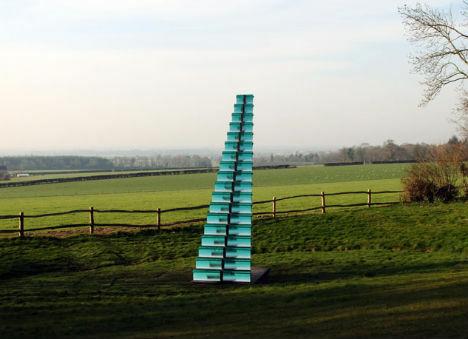 Fragile and luminescent, this sky-blue glass staircase seems an archetype of the phrase ‘stairway to heaven’. 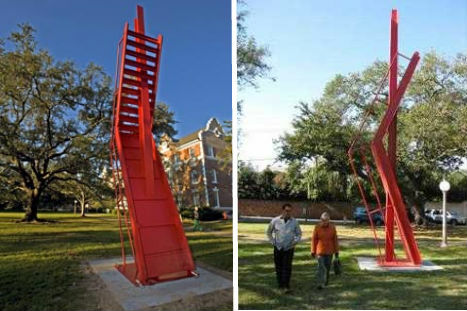 New Orleans’ Tulane University got a ‘Stairway to the Stars’ in 2008. The fire-engine-red, 28-foot tall sculpture by Mark de Suvero was one of six large modern sculptures added to the university’s quad. Designed by Dutch sculptor Rudi van de Wint, this majestic spiral staircase stands as an appropriate memorial for the 248 passengers who lost their lives during one of the deadliest accidents in the history of aviation, the crash at the Tenerife Airport in 1977. 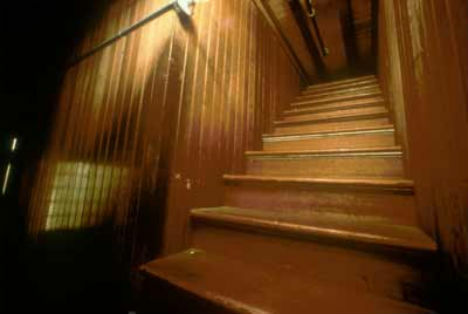 Some of the most famous stairs to nowhere are at the Winchester House in California. The product of a lonely widow’s frantic obsession with remodeling her house over and over again, 24 hours a day for 38 years. The reason? After the tragic deaths of her husband and infant, Mrs. Winchester consulted a psychic medium who told her that her family was haunted by ghosts that would never be happy unless she built a house for them. So she built, and built and built – and threw in some useless stairs, possibly to confuse the spirits that made her life so strange and difficult.